I was working at ABC in the aftermath of the 2000 election. 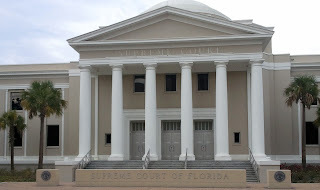 While the Bush and Gore legal teams duked it out, I had acquaintances that were stuck in Tallahassee for a month, setting up live shots every day in front of this building. Tallahassee is kind of an odd capital for a state with the expanse of Florida; geographically it doesn't make any sense. But it does have the deep south's taste for football. 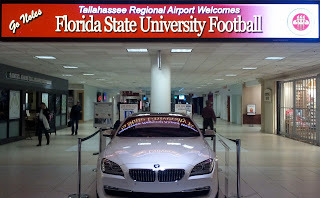 There are nods to the 'Noles wherever you go, even at my touchdown in Tallahassee. I would warm potential recruits that the BMW listed underneath the sign is not part of the deal, at least I don't think it is. Gauging the morale down here is a little strange too. They love the Seminoles and their 10 blowout wins, but are bitterly disappointed by the two 2nd Half collapses on the other side of the ledger versus NC State and Florida. Now Florida State needs to finish off 6-6 Georgia Tech in the ACC Championship game to go to the Orange Bowl. They are a 2-TD favorite. But I'm in town for the hoops. Florida State had a monumental season last year, knocking off Duke and North Carolina on back-to-back days to win their first ACC Championship. They host #21 Minnesota tonight in a tasty ACC/Big Ten showdown.